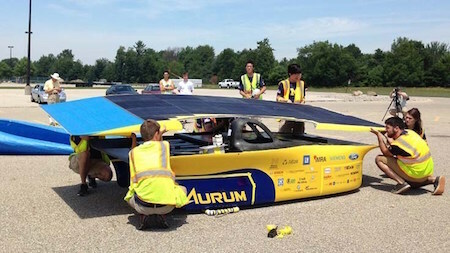 IBM Research is helping out the University of Michigan's solar car team by providing advanced solar forecasting. The UM student team will leverage IBM Research's cognitive computing expertise to gain real-time insights into conditions such as cloud cover and wind patterns as well as determine how much solar power will be available to fuel their car along the course race. As the car is solely powered by solar energy, more accurate forecasts can help the UM students decide how to drive their car more efficiently and improve their chances for winning. IBM researchers are using machine learning to blend data from sensor networks and local weather stations, cloud motion physics derived from sky cameras and satellite observations, and multiple weather prediction models. In contrast, most current forecasting techniques rely on individual weather models that offer a less comprehensive view of the variables that affect the availability of renewable energy such as solar. The vehicle he had chosen was not an unreasonable substitute for burros. It was extremely rugged, easy to operate, and almost foolproof. It drew its power from six square yards of sunpower screens on its low curved roof. These drove a constant- load motor, or, when halted, replenished the storage battery against cloudy weather, or night travel. The bearings were 'everlasting', and every moving part, other than the caterpillar treads and the controls, were sealed up, secure from inexpert tinkering.